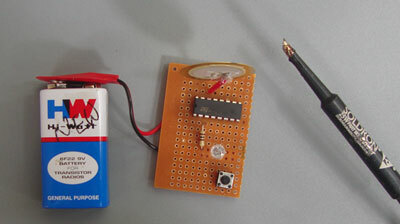 Circuit uses a Piezo element to collect the radiating energy from the electric equipment. 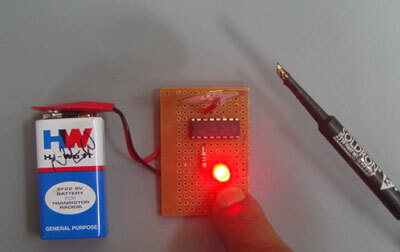 Piezo element is commonly used in Piezo buzzers to generate sound. It is a circular metal plate with a coating of Piezo electric material. 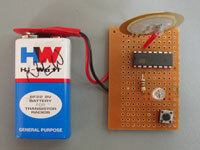 It can accept and store energy from the electric field. IC CD 4017 is the Johnson Decade Counter commonly used in chaser circuits. 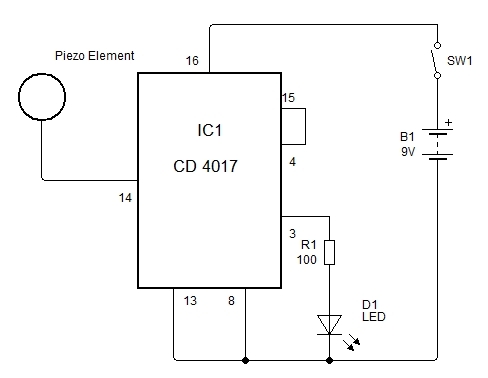 Its input pin 14 is very sensitive to external pulses. The electromagnetic pulses captured by the Piezo element enter into the input of IC and its outputs turn high one by one. Here only one output (pin3) is used to drive an LED. Output pin 4 is connected to the reset pin 15 to prevent further counting. When the Piezo element is around 1 foot away from the electric wire or equipment, LED starts blinking. Press SW1 while testing.